Psalm 23 is a Psalm of Trust. A Declaration of Confidence in God. The imagery and tone of the Psalm are peaceful: “green pastures,” “quiet waters,” a restored soul, the promise of God’s presence even when death and darkness are near. The LORD is my shepherd: he provides, he guides, he restores, he is with his sheep, and he comforts. “He makes me lie down in green pastures.” With God as my comforting shepherd, there is time to rest. Time to stop. Time to be still. Typically a shepherd leads sheep to a pasture where they can graze. The sheep still do work; the shepherd does the leading but not necessarily the feeding. As the Psalm progresses, God as comforting shepherd becomes welcoming host, who sets out a whole banquet for his flock. Psalm 23 is intensely personal. It’s a prayer of an individual to God; a song from one soul, who recognizes that the ruling king of the universe has taken the time to lead him to a restful spot to get a drink… to rest. David uses the first person singular pronoun throughout the Psalm. God is the shepherd of each individual who would follow him. This may seem slightly unremarkable to us. We live in a North American society that already tends toward individualism. Our cultural construction of the self tends to be individually-focused. The culture in which David found himself was much more communally-oriented. The sins of an individual and the corporate sins of the community were not always distinguished. A person’s sense of self was constructed and informed and shaped in a communal context. Identity for a Hebrew man or woman had much more to do with being a part of a chosen and called-out community. A chosen people, plural. So it’s at least a little remarkable, in the larger context of Hebrew worshiping society, that David begins–the Lord is MY shepherd. 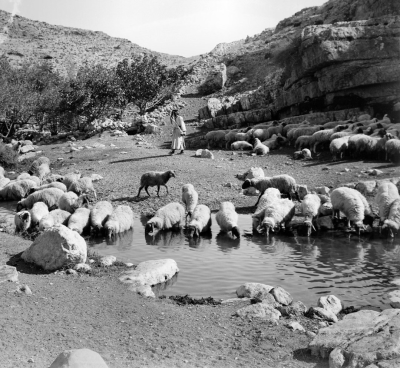 The idea of God as personal shepherd is consistent with Jesus’ interpretation of himself as shepherd. You remember the Christlike image of the shepherd who–even though he has 100 sheep–will stop and go find the one who goes missing. So it really is okay, and probably even closest to the original intent of this Psalm, to put your own name in there as you read it. Maybe it’s because I’ve been reading this Psalm through the lens of the news this week, but I’m beginning more and more to see Psalm 23 not only as an affirmation of trust and confidence in God, but also as a counter-circumstantial prayer of defiance. It’s a subversive prayer when you compare it to what you see around you. Verse 4 says, “Even though I walk through the valley of the shadow of death…” David seems to just take it as a given that life contains dark and death-filled valleys. But we don’t need a book to think of all the ways in which life is full of dark valleys. You’ve been in a dark valley before. Maybe you’re in one now. It can be a valley of darkness and shadows that you’ve found yourself in due to no choice of your own: some hurt or frustration someone has caused you; prayers that continue to go unanswered in the way you’d like to see answered; illness and physical ailment; unexpected and sudden grief. You could be in a valley of darkness and shadows that is more of your own making, too. Maybe your whole life doesn’t feel like a valley, but maybe you’re aware of your “shadow side” that you wouldn’t dare bring to church, that part or those parts of you that you don’t want anyone to see. Maybe you’ve looked inside and seen something in your heart that—it pains you to see—doesn’t please God. Or, to see some “valleys of the shadow of death,” you could just pay attention to global events this week. 4 children in Gaza—cousins—playing at the beach and shot dead from the ocean. An Israeli ground invasion into the Gaza Strip. Another Malaysian Airline plane crash full of passengers, this one shot down by a ground to air missile as it was flying over Ukraine. And if you really want to lose some faith in humanity, you probably have already heard that that airplane had something like 100 of the world’s top HIV/Aids researchers on their way to an international Aids conference. So, yes, there are plenty of valleys of the shadow of death and darkness that we walk through. And yet, even though—“even though I walk through through the valley of the shadow of death, I will fear no evil, for you are with me.” “Even though,” David says, in a hope-filled prayer of defiance. For whatever reason, when I hear “shepherd,” there’s part of me that thinks of a humble, young boy (or girl) walking sheep through beautiful country fields on a quiet, sunny day. And that’s right. 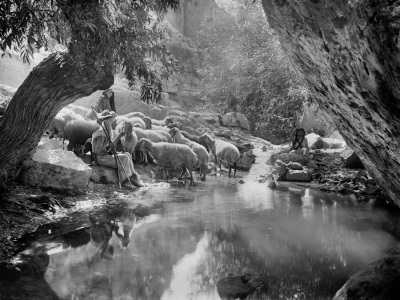 Leading your sheep to serenity is part and parcel of what it means to be a shepherd. Maybe it’s just me, but reading about a coming invasion by an Assyrian superpower, my first reaction is: What kind of a country would send their shepherds out to battle? But Micah is drawing on a rich tradition in the Scripture—especially in the Old Testament—of using “shepherd” imagery to describe kings, to describe commanders, to describe strong and mighty leaders. When Micah says “shepherd,” he is talking about a ruling king who goes to battle for his people. David, as a ruler himself, surely had this aspect of shepherding in mind. The readers and prayers and singers of this Psalm surely saw not just a shepherd to comfort me, not just a host to welcome me, but God as a ruler to protect me. This ruler won’t do away with all of life’s dark valleys—not yet, anyway—but he will be with me while I walk through them. The Lord is my shepherd, and his rod and his staff—weapons of protection in the hands of a skilled shepherd—fend off that which would attack us. Even the presence of enemies in verse 5 cannot keep this ruling shepherd from playing banquet host, setting out a feast for the ones he loves. So good shepherds are not to be trifled with, because they protect their flock. They walk with them through darkness. The Good Shepherd is a ruling king, and he keeps our modern-day enemies—shame, guilt, fear, anxiety, the accusations of others, stress, hatred… he keeps our modern-day enemies at bay. Even though life is full of valleys of the shadow of death, tens of thousands of things to potentially be miserable about, Jesus the Good Shepherd is a ruling king who STILL is sovereign over all he has made, no matter how fouled up it gets. So—when you’re riddled with doubt and self-loathing, or just questioning your worth? Say this Psalm. When you hear about wars and rumors of wars, say this Psalm. When your best friend gets sick, say this Psalm. When someone in your family grieves you by their seeming lack of care for you, say this Psalm. When you don’t know what the next year of your life holds, say this Psalm. When you have to do the hard work of reconciling with someone you have hurt or that has hurt you, say this Psalm. When you can’t pay your mortgage on time, say this Psalm. When you don’t want to get out of bed in the morning, say this Psalm. When you get scared of the dark, say this Psalm. The above is adapted from the sermon I preached today. Scripture quotations are from the 1984 NIV. See my other sermons gathered here, including the first Psalm of Summer sermon here. I love this Psalm. Thanks for sharing your sermon. I was impressed by your insights. This has always brought the image of Jesus the shepherd, powerful enough to allow me to lie down calmly and comfortably in the pasture, or guide me next to the calm water, if that’s where I want to go. Jesus is not someone you’d want to pick a fight with. Powerful, yet calm as necessary, able to quickly respond to any challenge. Thanks so much for your comment and kind words! Well put.